The increase of commercial advertisements on your browser usually means that you have a potentially unwanted application generating those ads for you. For instance, you may have EDealMan installed on your browser. 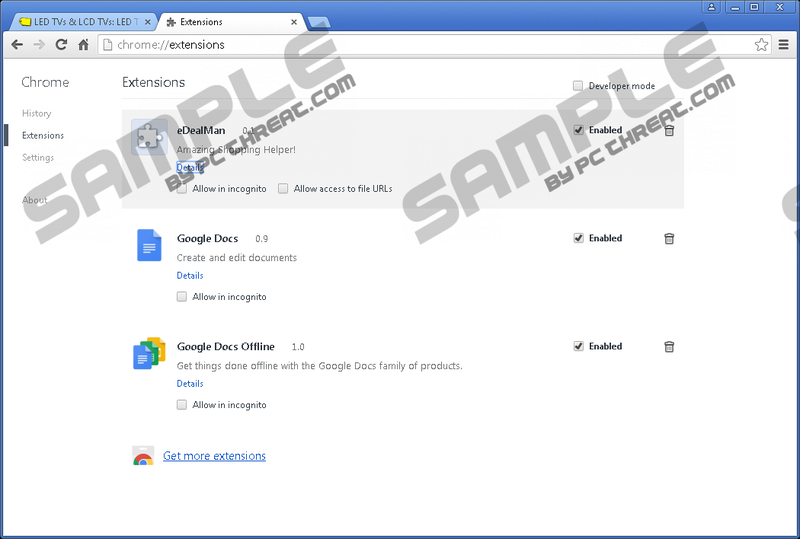 This browser extension works on the Chrome browser, and it is very often that users do not notice how it enters their systems. Computer security experts recommend that you remove EDealMan from your system because adware programs could easily lead to severe security problems in a blink of an eye. Please scroll down to the bottom of this article for the manual removal instructions, and do not hesitate to ask for assistance if necessary. During our tests, we have found that the official website for EDealMan is located at edealman.club. However, it does not seem like it would be possible to download this application from the main website, as clicking the Download button automatically redirects you to donnaplay.com. On the other hand, there are many other ways the application can use to enter your computer. For instance, EDealMan could also be downloaded from the Chrome Web Store. Since the application is compatible with the Chrome browser only, its developers have made sure to include it in the Chrome Web Store, too. What’s more, it would not be surprising if EDealMan came bundled with freeware as well. When you download freeware applications from the file-sharing websites, be sure to read all the steps on the installation wizard because you might be given a chance to avoid installing unwanted programs. The problem with adware applications is that users quite often can choose to deselect them, but they simply miss their chance because they are not attentive enough. When EDealMan is set up on your browser, you can expect to see a lot of commercial advertisements when you surf the web. The extension will collect data on your web browsing habits to find out what you usually look for online. This information is necessary because EDealMan needs to provide you with custom commercial content. When the content provided in the ads is related to your likes and preferences, there is a better chance that you will close those ads, and this is exactly what EDealMan is aiming for. We are not trying to say that this application will try to infect you with malware or anything like that. The point is that EDealMan needs to make money by redirecting you to affiliated websites. This application generates a financial profit each time you click an outgoing link in the ads. You get nothing in return, but it should not be anything dangerous. The problem arises from the fact that almost anyone could embed their content into the EDealMan ads. The application does not check whether the ad content is safe or not, so technically, the application is perfect for third-party content distribution. In the worst case scenario, you might also get infected with malware if you happen you click a corrupted link. Avoid any potential malware infections by removing EDealMan today. Uninstall the extension via your browser settings and then scan your PC with the SpyHunter free scanner. You have to be 100% sure that there are no other unwanted applications on-board, and you are bound to have several other undesirable programs because the likes of EDealMan seldom travel alone. Remove EDealMan from the list. Quick & tested solution for EDealMan removal.